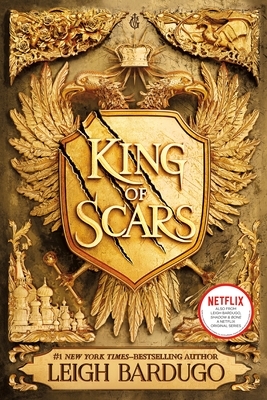 Enter the Grishaverse with the instant #1 New York Times-bestseller King of Scars by Leigh Bardugo. Face your demons...or feed them. The dashing young king, Nikolai Lantsov, has always had a gift for the impossible. No one knows what he endured in his country’s bloody civil war—and he intends to keep it that way. Now, as enemies gather at his weakened borders, Nikolai must find a way to refill Ravka’s coffers, forge new alliances, and stop a rising threat to the once-great Grisha Army. Yet with every day a dark magic within him grows stronger, threatening to destroy all he has built. With the help of a young monk and a legendary Grisha general, Nikolai will journey to the places in Ravka where the deepest magic survives to vanquish the terrible legacy inside him. He will risk everything to save his country and himself. But some secrets aren’t meant to stay buried—and some wounds aren’t meant to heal. "Why You’ll Love It: … Leigh Bardugo continues to breathe new life into her lush fantasy world, and it’s impossible to resist reading every single one. Leigh Bardugo is a #1 New York Times bestselling author of fantasy novels and the creator of the Grishaverse. With over 3 million copies sold worldwide, her Grishaverse spans the Shadow and Bone Trilogy, the Six of Crows Duology, The Language of Thorns, King of Scars—with more to come. Her other works include Wonder Woman: Warbringer and short stories that have appeared in The Best of Tor.com and the Best American Science Fiction & Fantasy. She lives in Los Angeles.